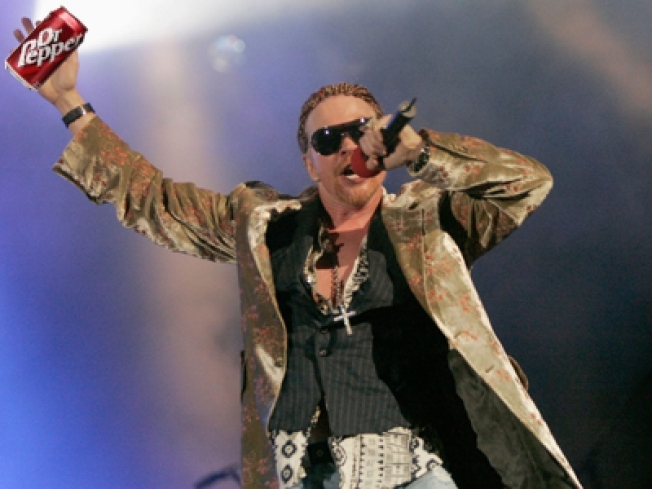 This photo illustration depicts Axl Rose's giant right hand holding a Dr. Pepper. He could have gotten that soda for free by printing a coupon from Dr. Pepper during a 24 window. Ok, here's the deal. Guns 'N Roses is infamous for delaying the release of an album they've been working on since 1994 and Dr. Pepper was so fed up with the wait that they placed a little wager...If Guns 'N Roses released their newest creation, "Chinese Democracy," by the end of the year, everyone in America would get a free Dr. Pepper. Guess what? They did it! "Chinese Democracy" hits shelves this Sunday, November 23. What's that mean for you? On Sunday, coupons for a free 20-ounce soda will be available for just 24 hours, and the coupons will be honored until February 28, 2010. Here's the website, www.drpepper.com, get your coupon. Maybe even pick up a copy of "Chinese Democracy" (after all, it's been 14 years in the making). Check out the G'N'R Myspage page to hear the tunes. More than 1 million people have already streamed the album. 1994: Rose begins work on "Chinese Democracy." 1996: Guitarist Slash quits the band. Drummer Matt Sorum and bassist Duff McKagan follow. "That sort of seemed like the beginning of this album," Brunner said. 1998: Rose assembles a new band, including Nine Inch Nails touring guitarist Robin Finck and former Replacements bassist Tommy Stinson. They begin making music at Rumbo Recorders, where GNR's original lineup recorded parts of its multi-platinum 1987 debut, "Appetite for Destruction." "That's when people started to think, 'What's he doing?' It seemed pretty bizarre to people who were fans of 'Paradise City,'" Brunner said. 1999: Rose invites Rolling Stone to preview tracks from "Chinese Democracy." The magazine anticipated the album could be released the following year. 2000: Rose hires two new musicians: guitarist Buckethead and drummer Brian "Brain" Mantia. The singer appears onstage for the first time in years during a surprise performance at a small Sunset Strip nightclub. 2001: Rose and the new GNR band perform new material at the House of Blues in Las Vegas. 2002: A cornrowed Rose and his band unveil a new track during a three-song medley at the MTV Video Music Awards. "What was striking about this is how little anyone was talking about the music," Brunner said. "It was all about his appearance and the fact that he showed up. It had nothing to do with the song itself. ... That's when it started seeming like things were not going in the right direction." 2004: Geffen declares that it has spent enough money on "Chinese Democracy" and that it's Rose's "obligation to fund and complete the album." The label releases a Guns N' Roses greatest-hits record. The label did not respond to a phone call and e-mail seeking comment on the album's many delays. 2006: Rose announces that "Chinese Democracy" won't be released in 2006 as planned and sets March 6, 2007, as the new release date. Four tracks from the album leak online. 2007: "Chinese Democracy" does not materialize. More tracks leak online. 2008: In March, Dr. Pepper announces it will give a free soda to everyone in America if "Chinese Democracy" is released before the end of the year. (The company says it is making good on its promise.) Two tracks are officially released in the fall: one in the "Rock Band 2" video game and another in the film "Body of Lies." In October, Geffen announces that "Chinese Democracy" will hit stores on Nov. 23. On Nov. 20, the album's 14 tracks stream on MySpace.com. "This is his shot," Brunner said. "If this doesn't connect now, I don't think anyone, another 15 years from now, will be panting over the long-awaited follow-up to 'Chinese Democracy.'" Dr. Pepper is owned by Dr. Pepper Snapple Group Inc.